← Most Golf Holes Played – Record Set! 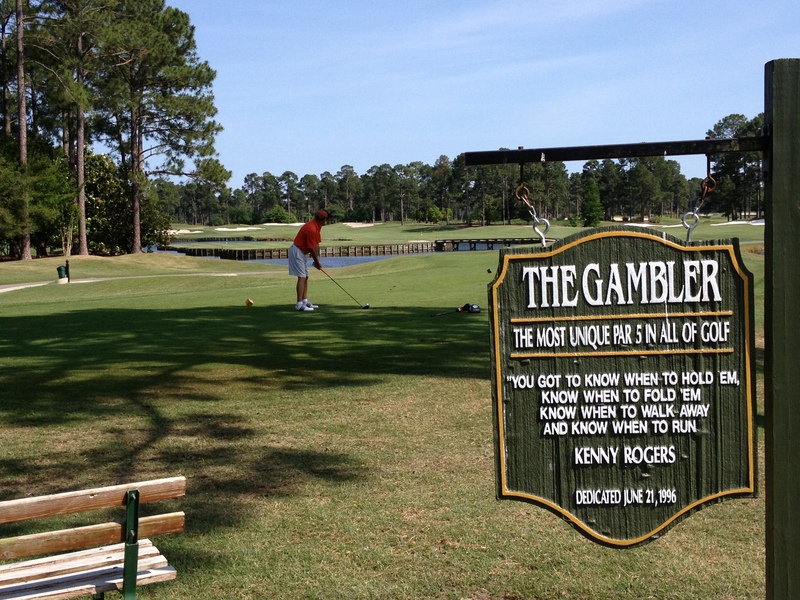 On May 27, 2013, I got my first look at Kings North at Myrtle Beach National Golf Club and I loved what I saw. Kings North is one of three Arnold Palmer designs at MBN and is the high end play. SouthCreek and The West Course are the other two and we opted for a replay on Kings after our scheduled 18 because we enjoyed it so much. Kings was built in 1973 and fully refurbished in 1996. We found Kings in excellent condition from tee to green with the Crenshaw bentgrass surfaces rolling medium-slow but very smooth. When you play Kings, several holes stick out in your mind which is an indicator of an excellent playing experience. 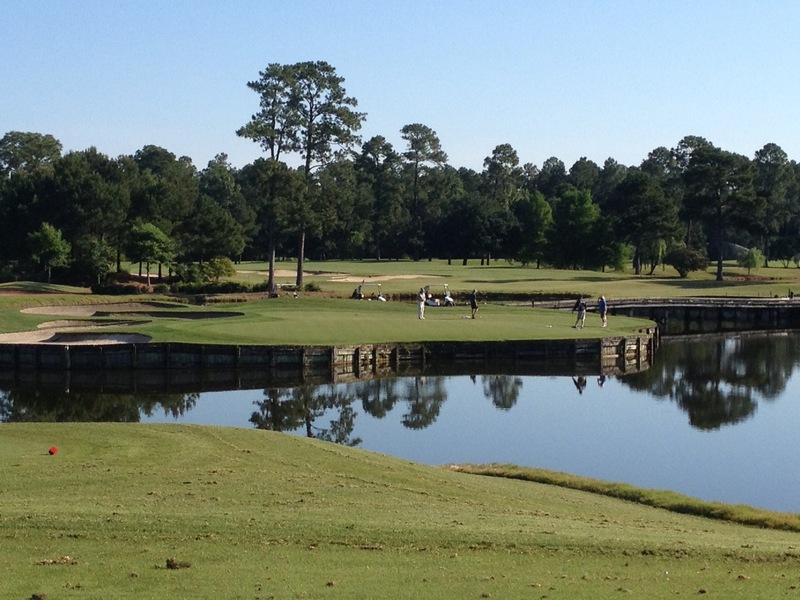 #6 is their signature hole known as The Gambler and is a par-5 with an island fairway left off the tee. When this hole is playing into the wind, don’t gamble on the island route because you need to hit it deep enough into the island to get a shorter iron to go for it in two. The green, which sits on a peninsula, is a water carry from either the island rout or the conventional fairway on the right and the gamble on the tee shot is just not worth it. The par three 12th hole (pictured earlier) is a drop dead beautiful island green that plays to 129 yards from the gold tees and is somewhat reminiscent of #17 at TPC at Sawgrass with regard to the length and size of landing area. If the pin is cut middle right and you are left, the downhill putt breaks much harder to the left than it looks and is fast. 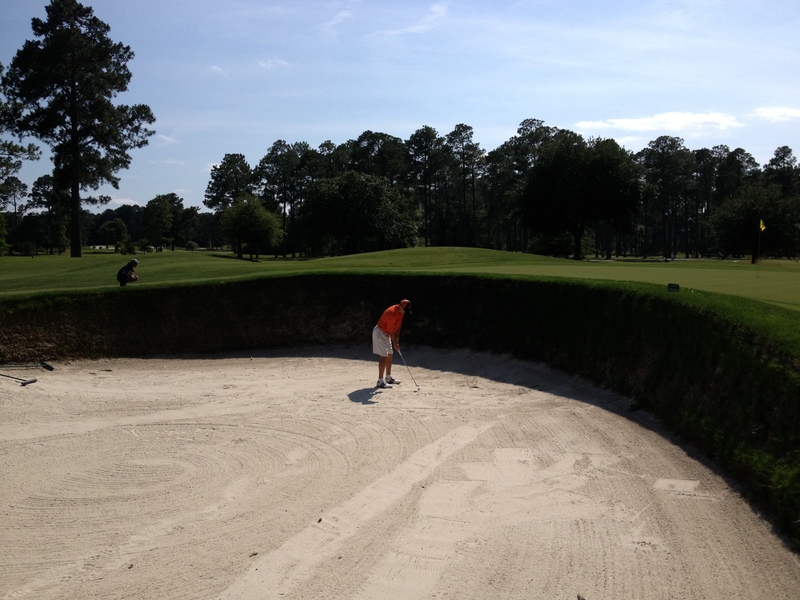 #5 pictured below is a lovely short par-4 with a massive bunker fronting the green that you do not want to be in. It’s 220 yards to clear the left fairway bunker which is the best play off the tee and will leave you with a wedge shot in. Long is safer on this hole. What’s great about this course is that #1 and #10 are benign par-5 holes that allow the golfer to get off to a good start and that’s appreciated on this tough but beautiful track. Our greens fees were included in the golf package but normally run $72 in the morning and $50 after 12:00 noon. We opted for that $50 afternoon rate and were told that was the replay rate. You can book an afternoon time for $50 so there really is no replay rate. In any case, we elected to replay Kings North in-lieu of the $30 replay at either of the sister courses, as Kings was just too good to pass up another play on. Range balls were $4.00 for a small basket and the balls were of good quality. The clubhouse and pro shop were large and well appointed. There were two medium-large practice putting greens adjacent to the clubhouse but chipping was discouraged there. The driving range had about 20-25 all grass hitting stations that were in good condition. The bag drop-off and cart staging area was right out front and were easy to access from the parking lot, clubhouse, and driving range. We were one of the first groups to arrive at the course but were running a little short on time for a warm-up. The guys at the bag drop were a bit slow to load our bags on carts for the short trip to the driving range, but the delay was only for a few minutes. Still, you expected a little snappier service from a club of this caliber. The proshop staff were businesslike but not overly friendly. We were visited regularly on the course by the food and beverage cart which was appreciated. On this day, I shot an 84 and an 86 from the gold tees which measured 6,481 yards (71.4/130). Overall, this was a very delightful experience and I would highly recommend Kings North. This entry was posted in Course Reviews, Myrtle Beach, Travel and tagged Arnold Palmer, course review, Golf, Kings North, Myrtle Beach, Myrtle Beach National, sports, travel. Bookmark the permalink.